Queen of Hearts©. 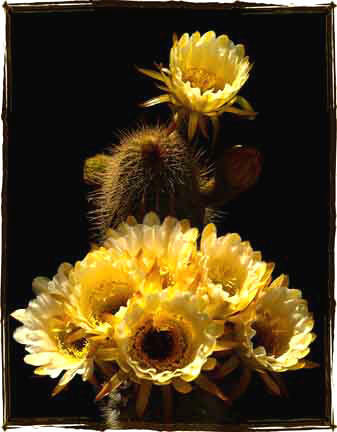 Any prickly pear can produce a yellow flower. Only a few prickly pears can produce red blossoms. 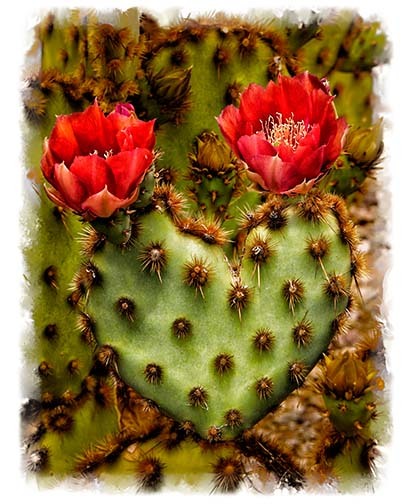 And every so often a prickly pear is seen to produce a double lobe in the shape of a heart. But it is rare indeed for the Queen of Hearts to appear, shooting two brilliant red blooms from its twin lobes. Sadly, next year her reign will be over as a stalk grows from each lobe. Showing Off©. 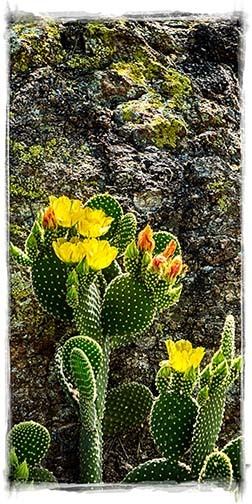 An early season bloomer, this prickly pear grows against a background of lichen-covered volcanic rock. Each bloom lasts barely a day, long enough for the bees and passing humming birds to enjoy its sweet nectar and to allow us to marvel at its strange rough delicacy. Simply Elegant©. What is it about the trichocereus? It doesn’t want to flower at all during the fall or the winter, no matter what the weather. Just another cactus. But then, sometime around April, they all effortlessly burst out with enormous multiple blooms. The gorgeous blooms pictured here are each nearly six inches wide. Surprise©. 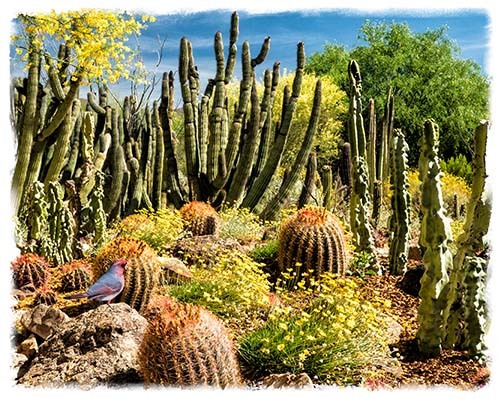 Gaze at the perfect tableau of saguaro and prickly pear cacti matched with the marvelous yellow flowers of the palo verdes behind them. Enjoy the early season flower on the prickly pear. However the surprise here is the single lovely purple-flowered hedgehog. Surrounded©. At least it feels as though we are surrounded. Between the barrel cacti and the Organ Pipes the yellow brittle brush seem to provide a soft flowery mat. Don’t relax too much—a fat rattlesnake just passed through on its hunt for mice and lizards. Where is it?©. 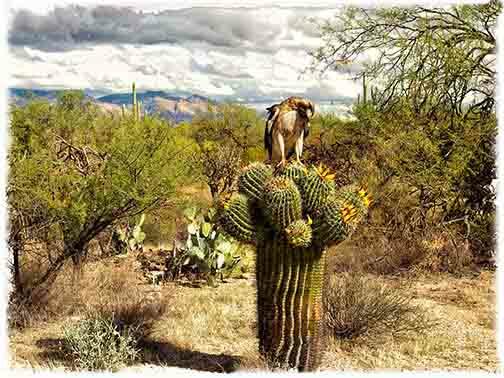 We generally see Harris hawks either atop saguaros or swooping over their prey. This is a little different. Apparently this sharp-eyed predator has spotted some juicy morsel climbing around the heads of the barrel cactus. Unusual by itself, the barrel is over five feet high and landing there may seem similar to landing on a saguaro. Wild Lace©. A bed of wild penstamen quietly grows and flowers, flashing red to the sun. Then, one year a magnificent intruder begins to push upward through the lacy flowers. 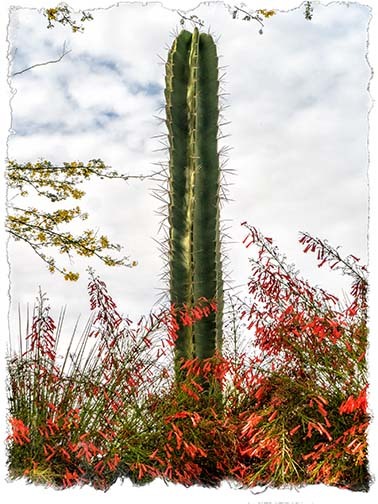 Here, a small columnar cactus, only a few feet tall, stands proudly dominating its garden surroundings.